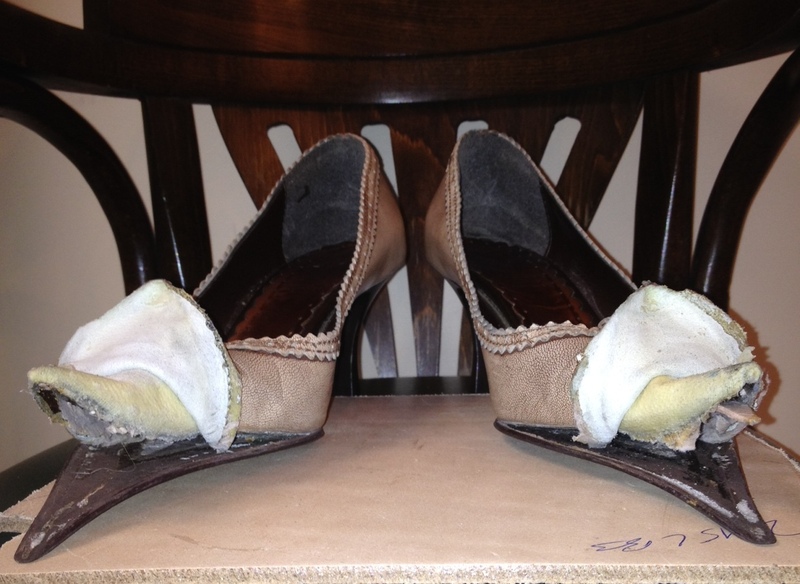 In this post, I wrote about my first pair of shoes that set me on the path of all things shoe. 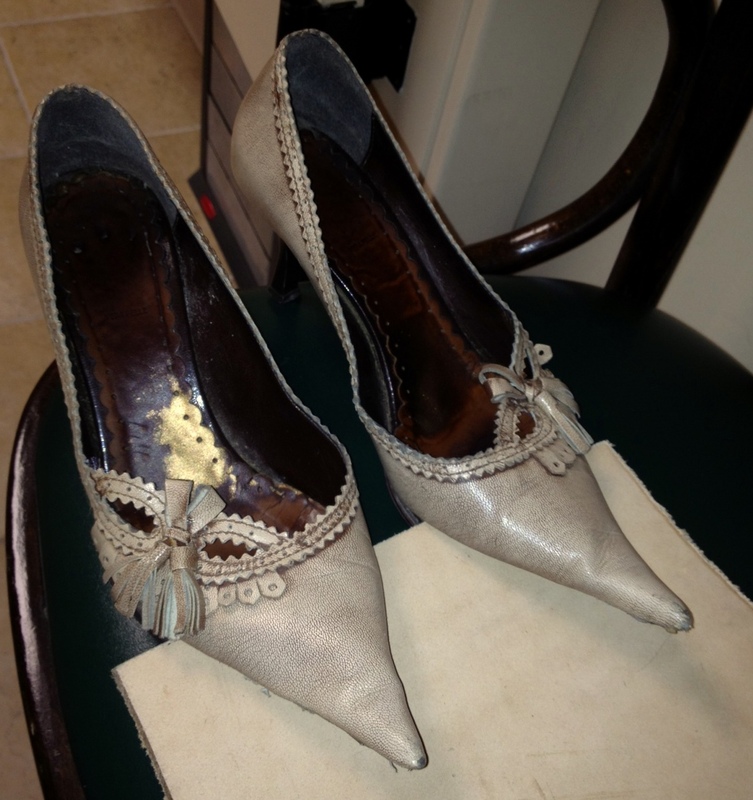 Those shoes are quite old and worn by now; for several years they were my only deviation from the standard black pump or black sandal. And I wore them a lot. The heel tips have been replaced, the very pointy toe tip has been given a lift a few times (being so pointy, it’s prone to wrinkling after a while) and the padding has also needed replacing. But now, I decided it was time for some big cosmetic work. So, I set out to find an experienced cobbler. Not a 'replace the tip on my heel shoe repair store' but a real shoe cobbler. Take a pair of fine (and they are fine) Italian made shoes to shoe repair shops for a complete reconstruction and you’ll soon find out which one is a store owner and which one is a cobbler. And I, my friends, have a real cobbler. Hassan, who now owns a Money’s Worth and Best close to my work, has been working with shoes for many, many years. As a matter of fact, it seems to be a bit of a family passion since he now has both his son and his nephew apprenticing under him. 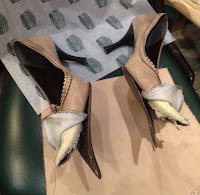 When I showed him the shoes and explained what I wanted done, he patiently explained all the intricate work he would have to do, the hours of work it would take and how just one wrong move with the old leather could ruin it. He promised nothing but agreed to take one apart to see what he could do. When I came back later, he showed me the condition of the leather, the lining, etc and very carefully explained what he had found. So the big question: Could he do it? With modest pride, he replied that of course he could! And, as any real craftsman, he won’t rush the work, so I am now patiently (okay, impatiently!) waiting as he painstakingly takes my shoes apart, redesigns them and then, eventually, puts them back together. In the meantime, he’s keeping me up to date with pictures of his progress.